Go if: You are fond of white romantic vaporous tutus waltzing on the stage. Adagio (ie. slow) dancing makes you happy. Skip if: You prefer your ballets full-length and plot driven, with loads of pyrotechnics on the side. Les Sylphides is a short (one act) plotless Romantic ballet, or as some would describe it, a ballet of mood, originally choreographed by Mikhail Fokine to music by Chopin. Although it is framed rather like the “divertissements in the forest” that take place in Act 2 of the full length Romantic ballet “La Sylphide”, Les Sylphides has nothing to do with and should not be confused with the former (different music, choreographer, motifs and themes). Perhaps because of the potential for confusion with La Sylphide some ballet companies still refer to Fokine’s work by its original title: Chopiniana or Reverie Romantique: Ballet sur la musique de Chopin, as performed at the Mariinsky Theatre in 1908. However named, the version danced nowadays is the one staged for Diaghilev’s Ballets Russes, premiered in Paris at the Theatre du Chatelet, the 2nd of June of 1909, with an original cast led by Anna Pavlova, Tamara Karsavina, Vaslav Nijinsky and Alexandra Baldina. The ballet’s theme is that of a young man walking at night and encountering a group of white sylphs (slender young women that are spirits of the air. The name Sylph is combined from the latin sylvestris=of the woods and nympha=nymph) dancing in the moonlight. The man joins in and dances with the sylphs. Some productions characterized this man as “a poet dreaming about his inspirations” (in many programmes the male role would be called poet) but this is really a ballet about the music rather than its characters and as the Royal Ballet ‘s programme notes, each of the female dancers is named after their own movements (Valse, Mazurka, Prelude). Given the romantic atmosphere of this piece, the ballet is very approachable and a staple in the repertory of nearly every major company in the world. 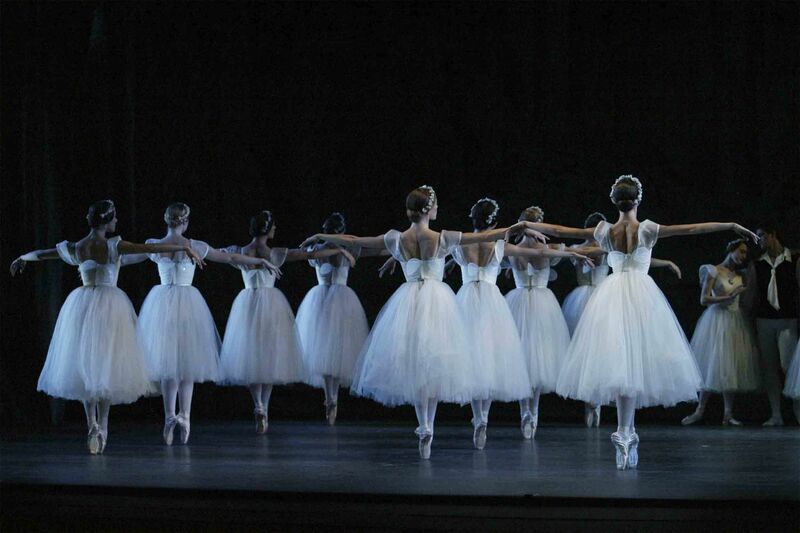 Women in white romantic tutus (ie. the long ones) are always evocative and who doesn’t like to spend half an hour looking at dreamy apparitions on stage? Wikipedia entry for Les Sylphides. ABT’s notes on Les Sylphides. Australia Dancing’s entry and research materials.